School, made a historic announcement. The Very Rev. German Balthazar Annunciation to be Vicar of the Church of the Holy Ghost, Nandakal, and Dean of North Bassein. The Rev. Jaime Columbano da Piedade Noronha, Chaplain Chapel of the Sacred Heart, Worli, to be Acting Vicar of the Church of Out Lady of Succour, Manori. The Rev. John Salvador Miranda, Vicar of the Church of the Mother of God, Palle, to be Priest-in-charge of the Chapel of the Sacred Heart, Worli. The Rev. Father Alfred Tillo, S.J., to be Priest-in-charge of the District of Chakala, Gundowli, etc. to be Assistant at the Church of St. Stephen, Cumbala Hill. The first Mass of the new Parish was celebrated in a small horse stable rented from the widow of a Hindu gentleman, Mr. Hiraial. (Thus, Holy Family had its origin in a stable, like the Holy Family itself. In 1945 the new Vicar, Fr. 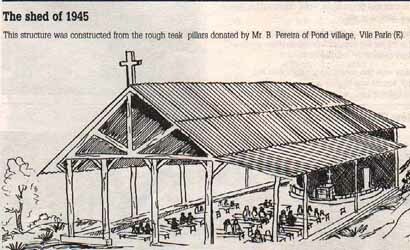 Denzil Keating S.J., constructed a bigger shed on the land lent by Vinayalaya. 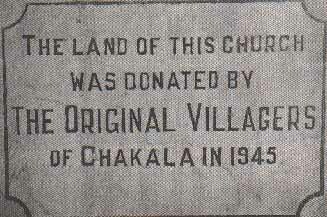 Later, during the year (1945), the original vilagers of Chakala led by the four Gonsalves families donated a plot of land for building a new Church. Like the previous stable, this structure too had only a roof and no the side walls. Hence, a few parishioners used to arrive early in the morning to have the Church swept and readied for Mass. His Eminence Valerian Cardinal Gracias blessed and laid the foundation stone of the new fan shaped Church building during the Vicarship of Fr. H. Jimenez S.J., who commenced the construction. 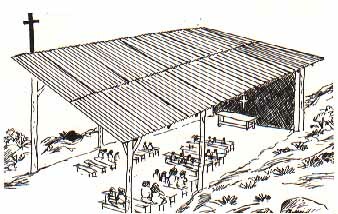 The idea of a fan shaped church building was conceived and propagated by Fr. 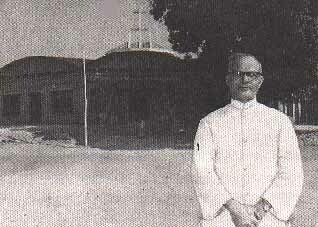 Britto S.J., in 1951, during his tenure as Parish Priest. Fr. Carsi S.J., was the person who designed and planned the entire project. The church and the attached parochial house is a beautiful example of environmental planning. Both the church and the parochial house is a single structure built on different levels, taking advantage of the natural topography. The civil construction of the church was supervised by Bro. Jacob Macwan S.J. The aluminium sheet roofing and wood work was done by the Vinayalaya carpentry shop, under the supervision of Bro. Eloy Molinis S.J. The M.S.structure was designed and executed by M/s. Richardson Cruddas. 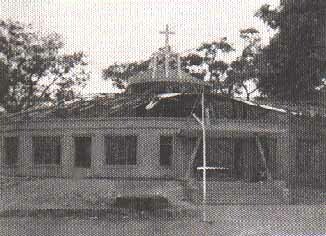 The Holy Family Parish's new church building was completed in 1962 and was blessed by His Eminence Valerian Cardinal Gracias on the 5th of March 1962. Fr. Salvador Marquis S.J., was the Vicar. At this juncture, credit must be given to Fr. Salvador Marquis S.J., whose untiring zeal and constant drive resulted in the early completion of the building. "Chakala needed a Fr. Marquis to put it on the map"
by Fr. J. Calvo S.J., the Vicar. Though sanctioned in 1962, it was consecrated only in June 1964 because this piece of land was a hillock. 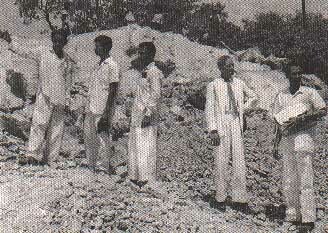 The task of clearing was arduous because the entire hill consisted of only a thin layer of top soil and then rock, which was too soft to be blasted yet-hard enough to make manual digging difficult. Several contractors left the work incomplete and also the Church coffers were empty, till finally out of desperation Fr. Marquis made a fervent appeal for loans. After which Mr. John S. Pereira contacted a young contractor, (Mr. M. Kasim), and personally supervised the clearing and digging. In June 1987, the new Parish of the Sacred Heart was formed, part of which is comprised of a north-eastern portion of Holy Family. To this new Parish was lent, 75 temporary graves for a maximum period of 15 years. This was during the tenure of Fr. Fio Mascarenhas S.J., as Vicar. 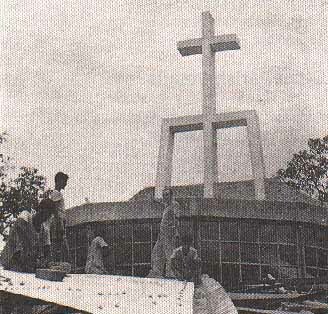 lst of May 1993, one more landmark in the history of the HOLY FAMILY PARISH. His Eminence Simon Cardinal Pimenta, Archbishop of Bombay, was the Chief Guest and Fr.Fio Mascarenhas, S.J., the Vicar. During the last fifty years, Holy Family has contributed tremendously to the upliftment of the have-nots through various schemes and projects as a service to God. The efforts and dedication of the parishioners towards the activities of the Parish have been whole-hearted. This rich tradition is an assurance of a bright future.